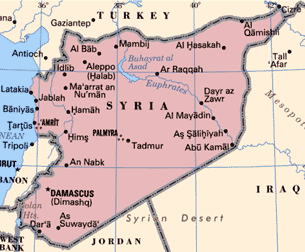 The Syrian Arab Republic covers an area of approximately 186,475 square kilometers and is located in the Middle East in Western Asia along the eastern part of the Mediterranean Sea. Arabic is regarded as the official language although French and English are used to a certain degree by the population. The currency is the Syrian Pound (SYP), which stood at SYP 47 to the US Dollar in March 2011 right before unrest gripped the country. However, it has faced severe fluctuations throughout the conflict and currently stands at more than SYP 200 to the US Dollar. The capital is based in Damascus, which is considered to be the oldest continuously inhabited city in the world. The country is comprised of fourteen provinces: Damascus, Rural Damascus, Aleppo, Homs, Hama, Lattakia, Tartous, Idleb, Deir Ez-Zor, Hassakeh, Raqqa, Quneitra, Daraa and Suwaida; and more than 60 administrative districts, which are broken up into several administrative units and municipalities. The population of Syria stood at approximately 23 million inhabitants in 2011, the majority of whom lived in urban areas. This figure is in addition to the estimated 15 million Syrian expatriates, including those who are originally Syrians residing abroad. Of the 23 million people who lived in Syria prior to the conflict, about a half has been displaced both internally and externally. While difficult to verify, around 35% of the population were individuals in their early teenage years or younger while the majority ranged from teenagers right up to senior citizens, with the latter constituting a small minority. This was the population composition of the country before the conflict and it is clear that young people made up a significant majority of the population. While the annual growth rate was expected to decrease, it averaged around 2.4% prior to the current unrest. Before the conflict, Syria’s economy mainly depended on the oil and gas, industry, agriculture and services sectors while its GDP grew at an average rate of 4.7% throughout the 2000s. The oil and gas industry was a fundamental contributor to its GDP when Syria produced an average of 380,000 barrels of oil per day after it peaked at over 600,000 barrels per day in 1996. Since many of the oil fields are located in the eastern part of the country that is presently outside of government control, production has declined significantly. Syrian oil was mainly sold to European markets before sanctions were imposed by the European Union in 2011. Natural gas production on the other hand used to average around 25 million cubic meters per day and has been less affected by the current crisis than the oil industry. Before the conflict, the country was shifting its focus to exporting natural gas since it had sufficient reserves. Aside from oil and gas, Syria’s natural resources include phosphate; iron, chrome and manganese ores; marble; gypsum; asphalt; and salt as well as others. In addition to products derived from these resources, the industrial sector is also focused on the production of textiles, which was considered a major component of the economy since Syria was a leading producer and exporter of cotton. Additionally, other products manufactured in Syria include food processing goods, beverages, tobacco, cement, oil seeds produce and automobiles. There is no doubt however that these industries have been affected to a considerable extent as a result of the ongoing conflict. The agricultural sector has been a cornerstone of the Syrian economy despite the fact that only one-third of the land in Syria is arable. Its main production consists of wheat, barley, cotton, lentils, chickpeas, olives, sugar beets, other fruits and vegetables, milk, eggs, poultry, beef and mutton. Before the unrest, government policy was aiming towards a diversification of the economy that would also witness the services sector playing a significant part. For instance, the tourism industry was averaging around 12% of GDP before the conflict. In terms of international trade, Syria’s main exports were crude oil and other petroleum products; minerals; fruits and vegetables; wheat; cereals; seeds; legumes; olive oil; pistachios; tobacco; meat and livestock; cotton; textiles; and clothing as well as other goods. Those goods were mainly destined for European and Arab markets. The European Union was considered Syria’s primary trade partner until the deterioration in relations started in 2011. As for Syria’s imports, these include petroleum products; machinery; food and livestock; metals; chemicals; plastics; yarn; paper and other goods. These products used to come from European and Arab countries as well as from Russia, China and Turkey. Syria enjoyed strong trade ties with Turkey up until 2011. At the present time, Iran is considered Syria’s leading supplier of goods. In light of the current situation, Syria’s imports and exports were reduced to a smaller scale. The information contained herein is general in nature and is not intended to address the circumstances of any particular individual or entity. Although the author has endeavored to provide accurate and timely information, he expressly disclaims all liability to any person with regard to anything done or omitted to be done, and with respect to the consequences of anything done or omitted to be done wholly or partly in reliance upon the whole or any part of the contents of this website. No reader should act or refrain from acting on the basis of any matter contained in this website without first obtaining appropriate professional advice concerning the particular fact and circumstances at issue. Syrian Law Journal © 2019. All Rights Reserved.